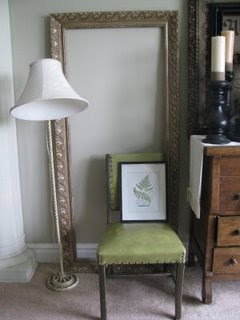 Frames are quite the popular item at garage sales and you can always find them at thrift stores. I got a couple of frames for a buck each at a garage sale and stuck paper in them. 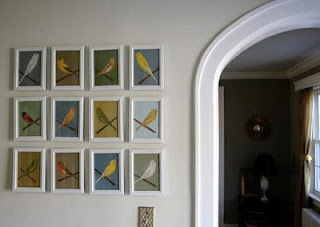 Smallish frames are pretty versatile and you can stick them in a number of different places. I also love this frame dressed with fabric. It makes such a beautiful backdrop. 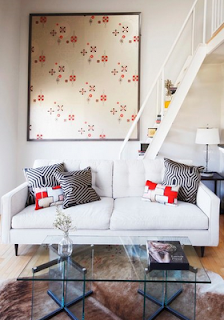 This design is by Jason Martin and I found it at one of my fav sites Little Green Notebook. Here is another idea from her site. This design is from Jack and Lulu. They used a bird book to fill these frames and make a stunning collage. You can also pull a Joy from Joys of Home and just leave your frames empty. I love all of the frames in her home. There really are so many possibilities with frames, and you can usually buy almost any size for under $5! I love that picture of the woman with the apples, where did you get it? Do you have any ideas of what to do with a door frame? I just bought a new door with the frame, but only needed the door. The frame has metal on the bottom, but the rest is a nice frame with molding. Maybe someone at DI will think of something when I donate it.